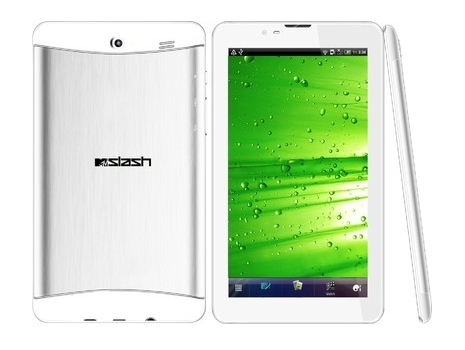 US Telecom Company launched its new budget tablet pc in India. The tablet called as Swipe MTV Slash and priced at Rs. 9,490 INR. The device now sells through popular online stores in India. The device sports a 7-Inch HD capacitive touchscreen display with 1024 x 600 Pixel screen resolution and it is a Dual-SIM (GSM + GSM) tablet with voice calling and dual stand-by features. The tablet powered by 1.0 GHz MTK 6577 dual-core processor along with 1 GB DDR3 RAM. The device storage needs managed by 4GB internal ROM and it expandable up to 32GB using Micro SD card slot. Swipe MTV Slash tablet loaded with latest version Android 4.1 Jelly Bean operating system and it features an 5.0 Megapixel rear facing camera along with an 0.3 Megapixel front facing camera which enables video call features. This tablet pc features Data through 2G, 3G, and Wi-Fi 802.11 b/g/n, GPRS, and EDGE along with Android web browser which enables smooth web browsing on the go. Other connectivity options available on Swipe MTV Slash are Bluetooth 4.0, GPS (with Google Map), Micro USB, and 3.5mm Audio Jack. The dimension of the tablet is 188.4 x 108 x 9mm and weight of the tablet is 280 g. The tablet has a 3000 mAh powerful battery which mange stand-by of the tablet. The tablet comes with eBook Reader, Kingsoft Office, Adobe Reader, Skype, Flash 11.1, Document Viewer, Email, and smooth Multi-tasking facilities. Swipe MTV Slash Android Tablet now listed on popular Indian online stores like Snapdeal and coming soon on Flipkart. Not yet available on physical markets. I think the Swipe Slash has a long way to go & will be for sure very Popular in the market because of its Vibrant looks & Features.